BC Astana celebrated the D1 title. 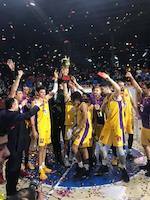 They beat Almatynski Legion 81:56 in the Final tonight. 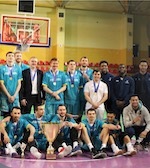 The victory marked the fourth consecutive trophy for BC Astana. Ramunas Butautas team jumped to a 26:21 lead after the opening quarter. They followed with a 22:9 rally in the second frame to gain a 48:30 halftime cushion. BC Astana did not slow down in the third term. They erupted for 25 points to boost the margin at 30-point mark. Almatynski Legion narrowed the distance in the fourth frame however BC Astana eased to the victory. Kaspiy earned the Bronze medals. They prevailed against Kapshagay 76:65 in the consolation final.